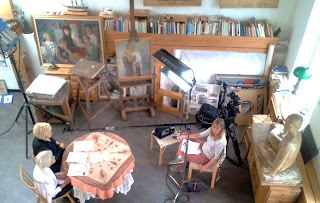 This documentary, made for BBC Four in 2012 by UWS doctoral researcher Eleanor Yule, reveals the strong autobiographical slant in the Moomins series, tracing the author's own extraordinary story from living the bohemian life of an artist in war-torn Helsinki to becoming a recluse on a remote island in the Gulf of Finland. Enjoying unprecedented access to Jansson's personal archive, the film reveals an unconventional, brave and compelling woman whose creative genius extended beyond Moominland to satire, fine art and masterful adult fiction - not least her highly-regarded The Summer Book. With home movie footage shot by her long-term female lover and companion, it offers a unique glimpse of an uncompromising fun-loving woman who developed love as the central theme of her work. A screening of the film will be followed by a discussion between director Eleanor Yule and Graham Jeffery, Reader in Music and Performance at UWS. Eleanor Yule is an award-winning director with a wide range of experience across film drama and broadcast documentary. Documentary highlights include a profile on Scots psychiatrist R.D.Laing, a critically acclaimed 'Omnibus' on French painter Pierre Bonnard, and a BAFTA nominated 'Bookmark' on celebrated novelist Muriel Spark. She also collaborated with ex - Python, Michael Palin, to produce one off documentaries about painters. Drama output includes Ghost Stories for Christmas starring veteran actor Christopher Lee, Lost, which she wrote and directed, and was nominated for a BAFTA new talent award, and her first feature Blinded, which won the Jury Award at the Celtic International Film Festival and a Silver Screen Award in L.A.